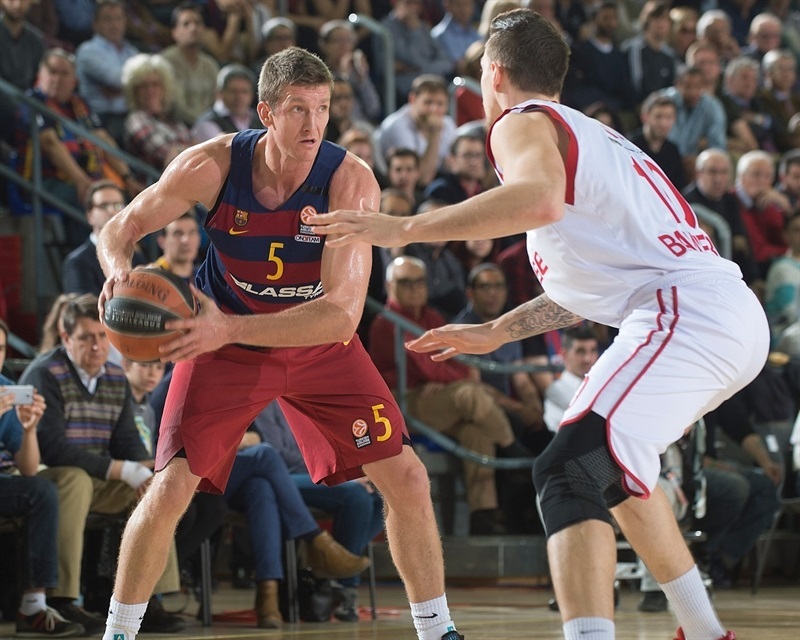 FC Barcelona Lassa improved its chances to reach the Turkish Airlines Euroleague playoffs in Group F by thrashing Brose Baskets Bamberg 75-57 at Palau Blaugrana on Thursday. 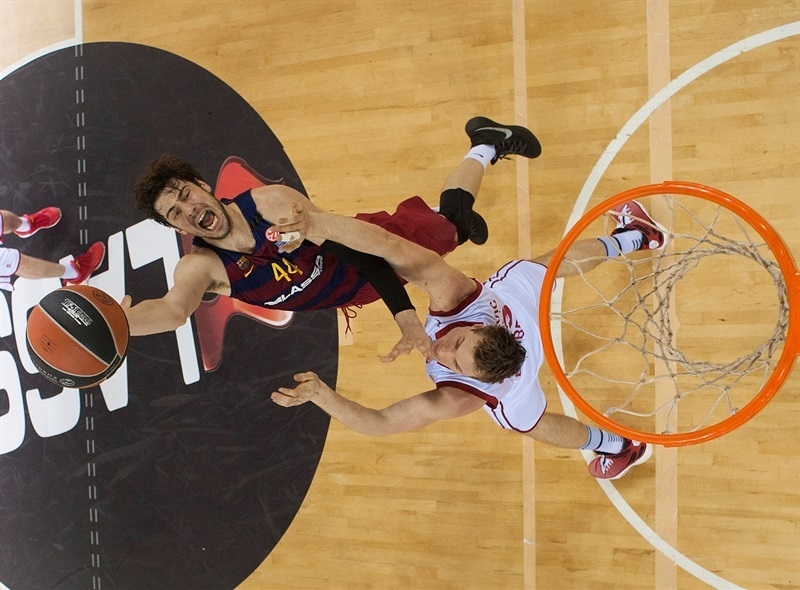 Barcelona improved to 7-6 and is not qualified to the playoffs yet, but will be if it beats Zalgiris Kaunas next week. Bamberg dropped to 6-7, but retains a slim chances to qualify. Bamberg will be fourth if it wins and both Olympiacos and Zalgiris win in Round 14, but eliminated in any other scenario. 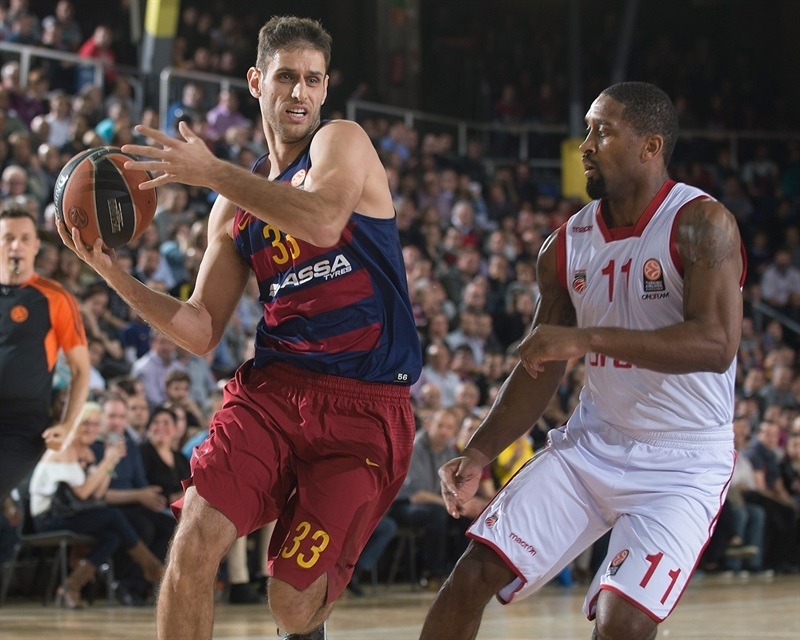 Alex Abrines paced the winners with 13 points, Ante Tomic and Justin Doellman each scored 12, Carlos Arroyo added 11 and Joey Dorsey posted 8 points and 9 rebounds in a balanced Barcelona attack. 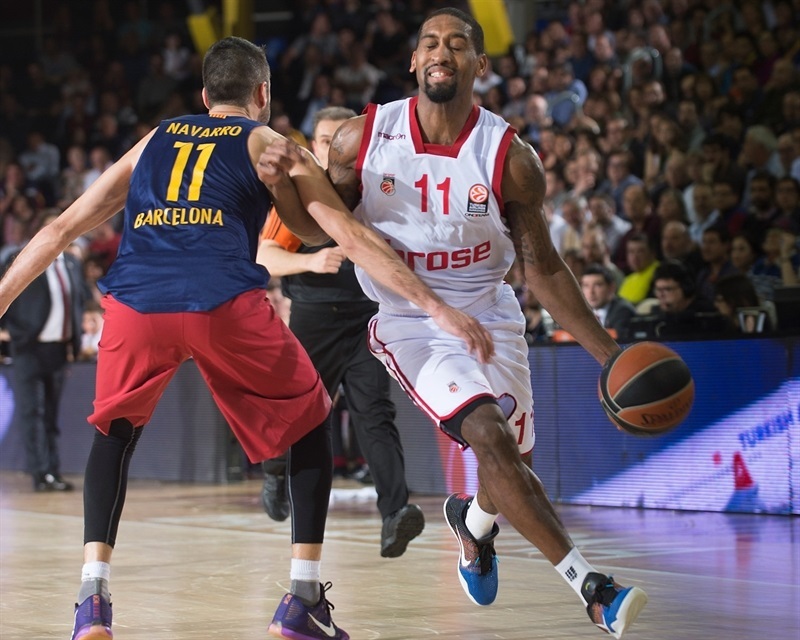 Brad Wanamaker tallied 16 points and 8 rebounds for Bamberg. Wanamaker had 7 quick points to give Bamberg an early 8-9 lead. Barcelona improved its defense and found a go-to guy in Tomic, who scored 4 points in a 10-0 run that gave the hosts an 18-12 margin after 10 minutes. Dorsey, Abrines and Doellman stepped for Barcelona on a 16-2 second-quarter run en route to a 43-23 halftime lead from which Bamberg never recovered. A moment of silence took place before the game to honor sports legend Johan Cruyff, who passed away last week. Wanamaker got Bamberg going with a baseline jumper and soon added a three-pointer for a 0-5 lead. 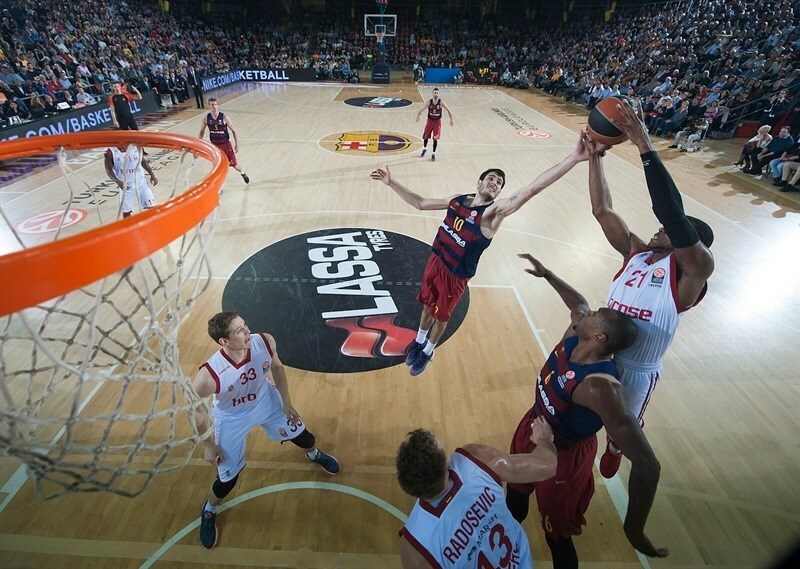 Brad Oleson rescued Barcelona with a layup-plus-foul and Stratos Perperoglou bettered Leon Radosevic's jump hook with a bomb from downtown. Dorsey ignited the crowd with a wild put-back slam that gave the hosts their first lead, 8-7. 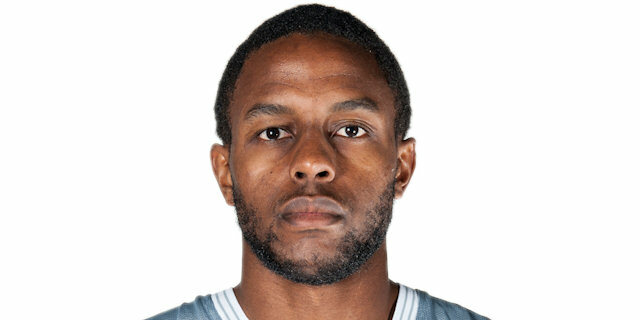 Wanamaker kept pacing Bamberg with an acrobatic basket that Doellman matched with a layup. 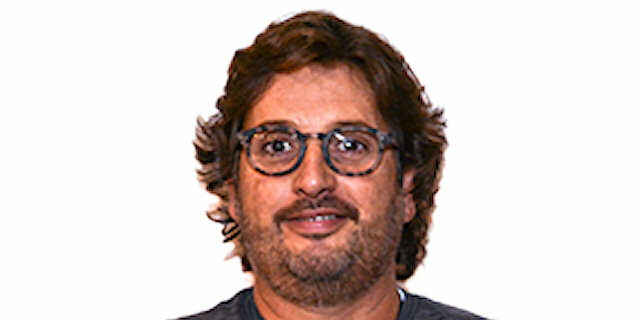 Barcelona kept powering the boards - 4 offensive rebounds in the opening five minutes - and an off-balance basket by Dorsey boosted his team's lead to 12-9. Bamberg tried to improve its ball circulation by bringing Nikos Zisis off the bench, but the guests kept missing shots. 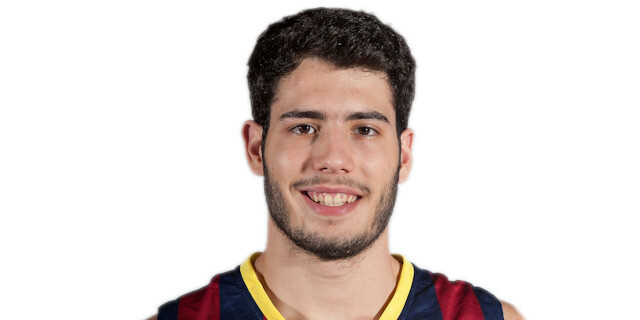 Abrines buried a six-meter jumper that caused the guests to call timeout at 14-9. Tomic drew a couple of fouls and made all 4 free throws, but a buzzer-beating triple by Wanamaker brought Bamberg within 18-12 after 10 minutes. Zisis nailed a one-handed floater in the lane early in the quarter and Lucca Staiger bettered Arroyo's long baseline jumper with a three-pointer that kept Bamberg within 20-17. Abrines sank a mid-range jumper that Darius Miller matched with a driving layup. Arroyo kept pushing Barcelona with a triple from the top of the key and Doellman followed that with a fast break layup to get the crowd involved at 27-19. Abrines and Doellman made free throws to make it a double-digit game, 32-19. 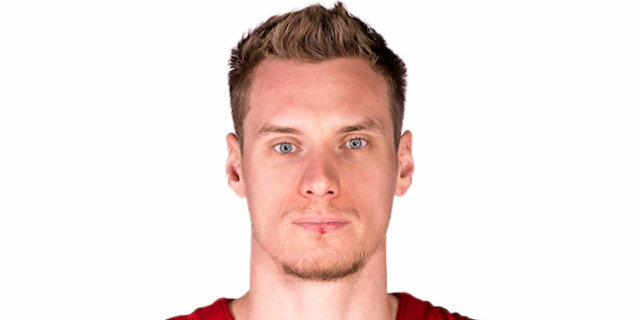 Janis Strelnieks tried to change things for Bamberg with a driving layup, but Arroyo found Dorsey for a wild alley-oop dunk and Doellman added a jump hook for a 15-point Barcelona lead. 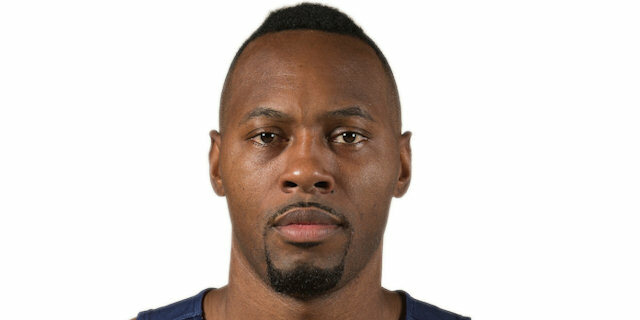 Doellman banked in a close shot, and after Strelnieks and Dorsey exchanged free throws, Tomas Satoransky gave the hosts a 43-23 halftime advantage. Abrines hit a technical free throw right after the break and soon added a three-pointer to break the game open at 47-23. Bamberg was held scoreless for more than two minutes until Wanamaker stepped up with a stop-and-pop jumper and a driving layup. A mid-range jumper by Zisis soon brought the guests a bit closer, 47-29. Doellman buried a turnaround jumper that Miller erased with a floater in the lane. 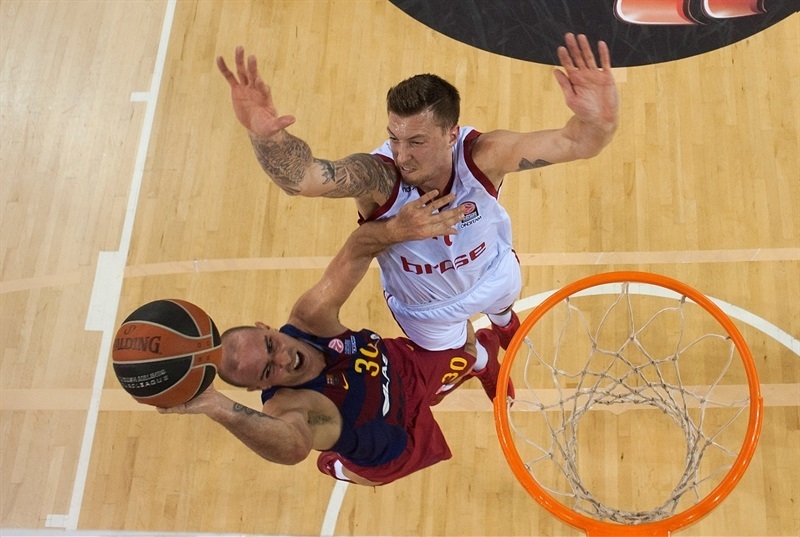 Juan Carlos Navarro and Patrick Heckmann traded free throws and a jumper by Daniel Theis gave Bamberg hope at 51-35. 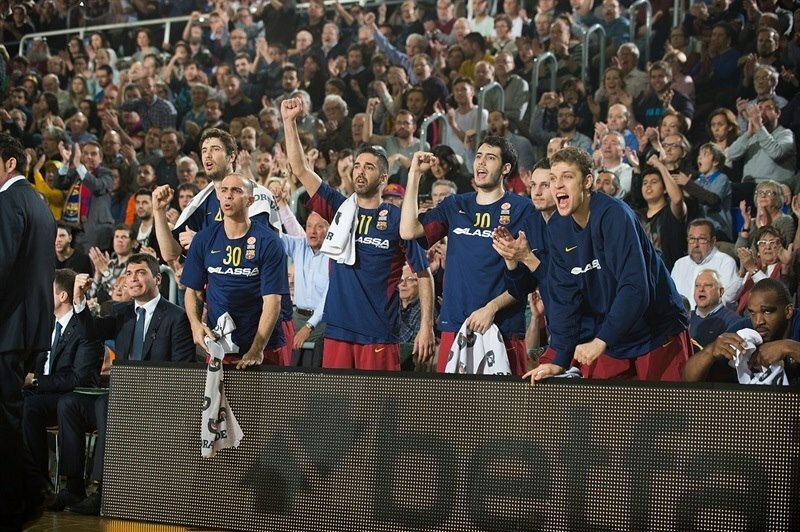 Tomic banked in a jump hook and Abrines added free throws, but Theis singlehandedly kept the guests alive at 55-39. Tomic scored in the low post and Perperoglou added a layup that prompted Bamberg to stop the game at 59-39. Miller shined with a reverse layup to make it 59-41 after 30 minutes. Tomic scored in the low post early in the quarter, as Barcelona opted for a veteran-filled backcourt, with Arroyo and Navarro together on court, to run the game clock down as much as possible. Strelnieks downed a jumper, but a free throw by Arroyo and a layup by Tomic gave Barcelona a 64-43 lead with seven minutes left. Arroyo struck from downtown before Bamberg stopped the game at 67-43. 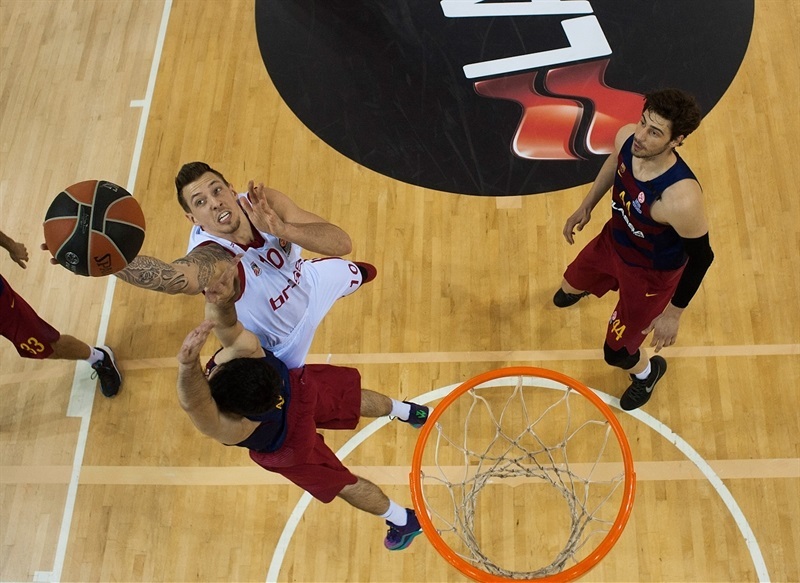 Wanamaker downed a mid-range jumper and Strelnieks scored again, as Barcelona struggled to get its big men involved off the guests' timeout. By the time Arroyo hit a close jumper, everything was said and done. 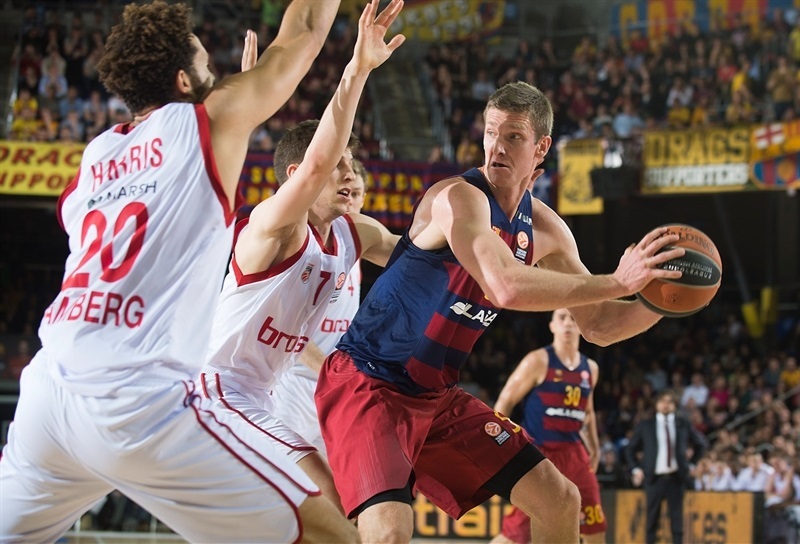 Barcelona walked off the court knowing it depends on its own result to reach the next round - and Bamberg knows it will need to win and get help from others in order to make it to the playoffs. "We are very happy with this win. I want to thank our fans, as always, and everyone who came today, for helping us to play good basketball. We had an excellent first half against a team that is really hard to play defense against and plays good team basketball. I want to congratulate them because they are one of the teams that is playing the best basketball this season. They have a lot of quality when it comes to circulating the ball and we managed to stop their creation with good defensive work. On offense, we made very few turnovers and controlled the game, which was critical to break the game at halftime. We tried to at least tie in the third quarter and managed to do it. We missed three-point shots and stopped scoring, missing some open shots. We dominated the game and were the fair winners. We had planned the game as if it was the most important so far and so it was. We got the first win and need another, against Zalgiris, next week. We said at the beginning of the Top 16 that eight wins would be needed to advance and it was confirmed. It was an important game and we did a good job. Now we have to play well on a court where we have already beaten a tough opponent. Practically everyone who advances has been strong at home. The Top 16 is always like this. 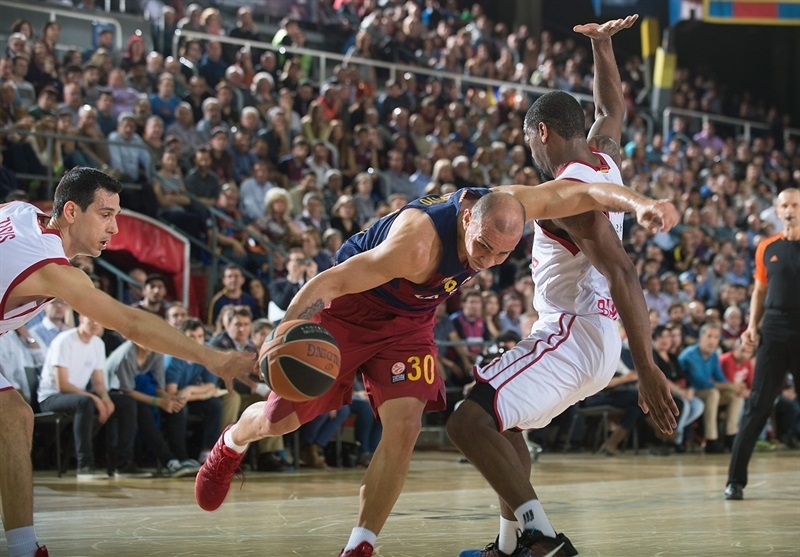 If we had not lost against Laboral Kutxa, maybe we would see things in a different way now. We have to win on the road to qualify. We play first and must get this win to avoid watching the rest of games without being nervous." 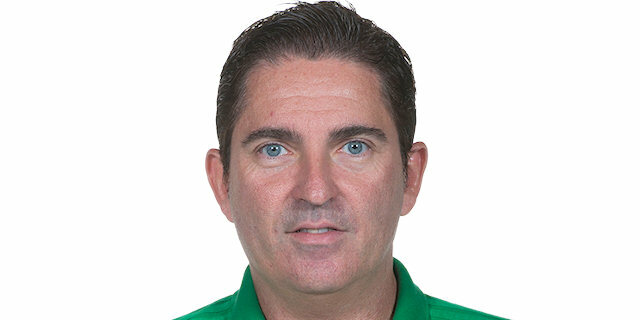 "First of all, congratulations to FC Barcelona, Xavi Pascual and his players. It was a deserved win for them. It is not easy for me to talk under these circumstances after a tough loss. It leaves a bad taste in your mouth and I have to stay by my players' side. I wish we could have played better basketball, but it was not possible under these circumstances. We played against a very good, very strong team. I am proud of my players, but the game had a lot of contact and we didn't know how to solve that. I am proud of my players and this organization. We went to play on every court, sometimes we won, sometimes we lost, but we beat every team at least once. My players should go out of this arena with their heads up, even after a tough loss. We fought too much against their physicality, Dorsey and all the Barcelona players. Every time we had to fight, we didn't have the experience to do it well." "We’ve been practicing so hard the last couple of days on this game, beating each other up in practice being real physical getting ready for this game. There was no tomorrow. Everybody put their energy and effort into the game tonight. We played great team defense, no turnovers in the first half, maybe 3 or 4, that’s what made the outcome. I tried to come out and play with the same intensity as I played against Madrid. I am only playing one game per week, so I gotta put all my energy into so we win. " "Truth to be told, it is a very important win for us. The team was fully aware of it from the very beginning of the game, and did an excellent job on offense and defense. We deserved the win. We didn't let them feel comfortable on offense. Bamberg is a team that plays well and rotates the ball well, but especially our pick-and-roll defense allowed them to prevent them from circulating the ball to the weak side. They had to look for options, which they are now used to - and limited them to 57 points. We tried to find different options and change some plays in the second half. We kept the difference and that's it. We cannot play the whole game the same way, you need to change things." "They beat us. I would say we were not prepared for the toughness they brought to the floor. I think this was the big difference, them playing hard and tough and us not being hard and tough. I don’t like when people underestimate us. We proved this season we are a big team. I am happy about that, but sad that our chances are much worse than they were before this game. " "We didn’t make any shots. They were really prepared; they knew what we were going to do and they took advantage of it. We didn’t play well and they were excellent. We’re proud of what we’ve done, but we want to compete evert night. They’re experienced and a really good team and they came out and played that way. "